Anyone who's ever worked with a malignant narcissist knows how much discord one person can sow. A fog of confusion descends, and the environment seems to become more toxic by the minute. That's because people with disordered personalities thrive on drama and division, which they create by spreading false rumors with a little bit of truth mixed in, to make the story more plausible. They also recruit flying monkeys, whom they artfully manipulate to carry out their agenda. Typically one target is chosen, and the idea is to drive this person out of his or her job. After a short breather, another target is selected. Meanwhile, because the air has become poisoned, no one is happy. However, it's very difficult to figure out exactly what's going on. That's because an adult who suffers from a character flaw, serious enough to bully another, knows their number will be up if they don't use a lot of smoke and mirrors to deflect attention away from their own misdeeds. One tried and true trick is to blame everything on an innocent person, who happens to be their target. Then, they need to convince everyone else that things will improve if this person is banished. If you continue reading, I'll explain just what tools a malignant narcissist likes to use as a wedge, to divide, conquer and emerge victorious. 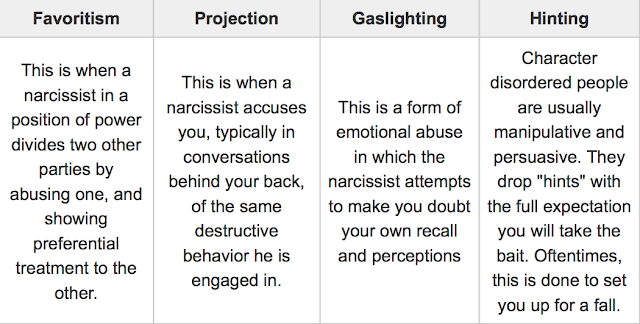 Narcissists are masters of deception. They like to project their own faults and shortcomings onto others, and, when they pick a target, this is what they do. This defense mechanism serves two purposes. It effectively shields them from the blame. It also allows them to operate under the delusion that the victim deserves or has somehow earned this treatment. Oftentimes, this is done as a pity ploy. A malignant narcissist will drum up sympathy by claiming to be the victim. In a role reversal, they claim the target is the one causing trouble for them. Eventually, the entire office sympathizes with the perpetrator and turns upon the target. 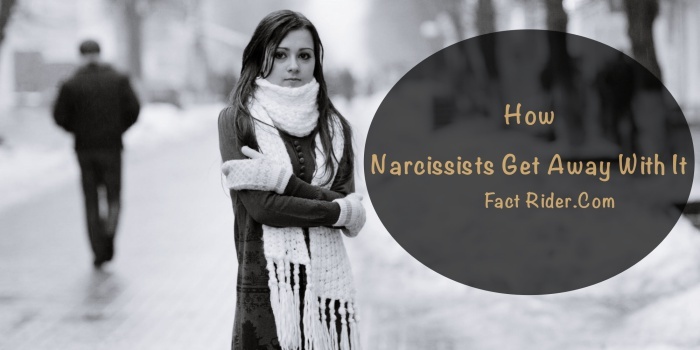 Some experts believe malignant narcissists and sociopaths are really two different manifestations of the same disorder, or at least there's only a very fine line separating them. In her classic book, The Sociopath Next Door, Dr. Martha Stout, PhD., tries to give us clues as to how to spot these charlatans when we first encounter them. This is a very difficult task, she concedes, because character disordered people often come across as charming, at least initially. However, she notes, there is one tip off. Beware of a new acquaintance who tries to play upon your sympathies. This is a common thread she's noticed among sociopaths. The word "grooming" usually applies fixing one's hair and putting on some makeup. But, in this case, it means the narcissist is set on sizing up his or her target. If the predator is a woman, this usually involves getting to know you better by establishing a fake friendship. She'll pretend to share a lot of intimate secrets with you. Actually, some of what she's telling you make make you a little uncomfortable, because it seems as if she's revealing too much too soon. But don't worry. She knows not to say anything you could ever use as leverage against her. She's way too clever for that. However, most of us are socialized to reciprocate in our speech. If someone says something, we'll usually respond. A malignant narcissist will bait you to respond. She share some of her secrets, hoping you share yours. This is a tactic that often works because she'll also ask you pointed questions, and stare at you while waiting for an answer. To counter the awkwardness this creates, you just might spill your guts. Sociopaths do seem to be able to maintain sustained eye contact longer than the rest of the population. Some people have referred to this as the "predatory stare." People with narcissistic personality disorder would register high on the scale of manipulative behavior, if they were tested. They are extremely clever and seem to have superhuman ability to "read" other people, and to assess various social situations. They tend to zero in on people's weaknesses, and then adjust accordingly. A target's weaknesses will be used against her. If the narcissist wishes to draw people to their cause, they'll work hard to fulfill their most pressing needs. Say, for instance, someone has an unhealthy desire to fit in and be accepted. The narcissist will make this person her right hand gal. Another coworker may be juggling a work schedule with caring for an aging parent. In order to win their loyalty, the narcissist will offer to stay with your parent on Saturday afternoon, so you can go grocery shopping. She'll also bring you a nice, home-cooked meal every Wednesday night. By manipulating everyone else in the office, the narcissist now has a loyal team of supporters. They've all been fed lies about the target, who is now showing signs of emotional fragility. She looks glum and she seems a little angry. This fits perfectly with the bully's assessment of her of being emotionally "unstable." That way, if the target tries to complain, she won't know where to begin. Each incident alone will sound petty and trivial. If she goes to the Human Resources department, and points her finger at several people, you can guess the rest. She'll be quickly branded as the troublemaker. Disordered personalities often subtly direct others to accomplish certain tasks by a behavioral mechanism called "hinting." They don't directly come out and ask you to do something. Instead, they drop a hint you'll likely follow through on. They like to pull this tactic out of their toolbox when setting their target up for a fall. For instance, they might complain to your supervisor that you spend a lot of time away from your desk, with the implication that you aren't getting a lot of work done. To cement this impression, they drop some "hints" that encourage you to walk around the office more than you normally would. To do this, they exploit your natural willingness to help. "My office needs an overhaul, because more clients are starting to visit," they may tell you. "Would you mind coming in and giving me some suggestions?" Thinking that you're aiding the company, you agree to stop by after lunch. The narcissist prolongs the conversation about redoing her office. Then, she tells your supervisor you disrupted her workday with useless chitchat. Directed conversations is a tactic often used by flying monkeys, whom are partner bullies. They will be fed lines to say within your hearing range, designed to confuse or disturb you. Here is an example. Someone being edged out of a job may no longer be invited to key, important meetings that once required their presence. However, because they are still invested in their job, they may be highly interested in what's being discussed. 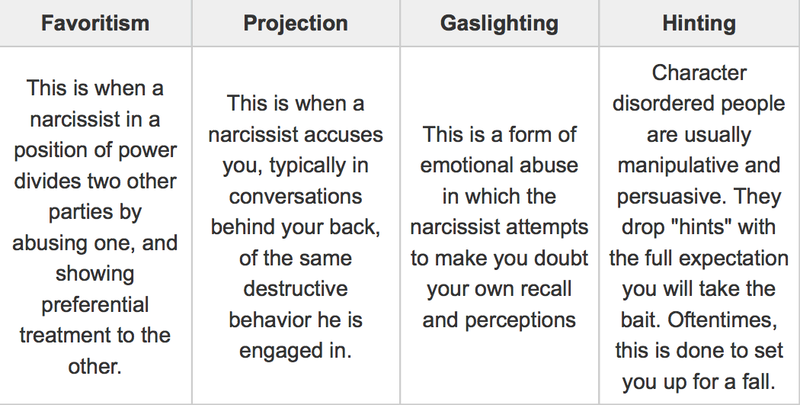 The narcissist will make sure one or more of her flying monkeys walks by your desk, and lets you catch a snippet of the conversation, about how someone else is now being assigned tasks once delegated to you. This is done solely to hurt your feelings. The immediate goal of the abuser is to make you so miserable that you can no longer do your job, and ultimately leave the organization. Most of the time this tactic works. An estimated 75 percent of targets are either fired from their position, or submit a voluntary resignation, according to the Workplace Bullying Institute, an advocacy group established to help victims of workplace abuse. However, this doesn't mean the abuser will suddenly turn nice and the office will now run smoothly. The narcissist will soon select another target and the cycle will continue.